spring and summer surf camps. OUR SPRING AND SUMMER SURF CAMP AND CALIFORNIA SURF SCHOOL IS A GREAT WAY FOR KIDS AND TEENS TO LEARN OCEAN SAFETY WHILE HAVING FUN SURFING! Exclusively available at Learn To Surf LA, our seasonal Surf Camps are perfect for kids and teens aged 5 to 17. We’ve been operating since 2002, and our intensive half-day or full-day surf school sessions help students build confidence and improve their skills quickly. We provide free extended care from 9:00 a.m., with an extended childcare option from as early as 8:00 a.m.
Everything is provided, including safe, comfortable foam surfboards as well as bodyboards and full-length and spring wetsuits. Snacks and drinks are offered at no extra charge, and we also put up canopies to provide shade from the Southern California sun and prevent excess sun exposure. Check out some PHOTOS from our previous camps! We can extend our dates. You may qualify for government assistance with your surf camp expenses. ENROLL IN OUR SUNNY SOUTHERN CALIFORNIA SURF CAMP, AVAILABLE AT TWO LOCATIONS IN THE LOS ANGELES AREA. 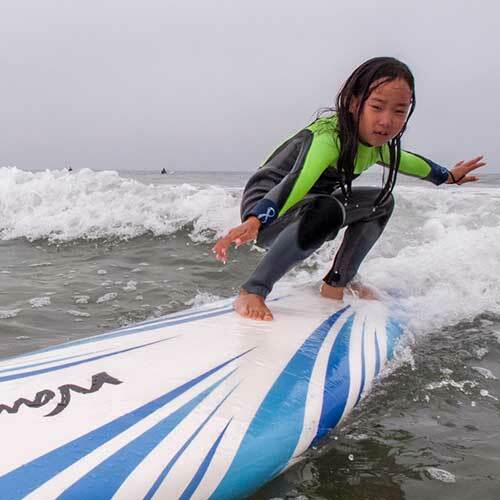 Surf Camp, our annual spring and summer California surf school for youths, is available at two locations: Santa Monica/Venice Beach, and Manhattan Beach/El Porto. Learn to Surf LA’s Surf Camps both have excellent locations in the LA area. Conveniently located at the end of the 10 and the 105 freeways, it’s an easy drive to our surf camps from Malibu, the Valley and Greater Los Angeles as well as for those coming from the South Bay. Both breaks we operate at have gently sloping sandy bottom, such that the waves here break much more mildly compared to most other breaks. We are very fortunate to have two great locations with a wide range of wave conditions for all skill levels. These are some of the easiest waves to learn to surf on that you’ll ever find! Our qualified, experienced instructors are CPR and First Aid trained, as your child’s safety is our primary concern. In the years since opening our doors in 2002, we have refined our instructional technique to the point at which we can provide the most value to our campers: our maximum instructor to student ratio of 5 to 1 ensures that every child gets substantial individual attention (some schools have a ratio of up to 10 to one), while still providing an affordable value to parents. Our students will learn about wave dynamics, ocean safety and awareness, how to deal with rip-currents, popping up on a surf board, handling the board in the water, turning, wave selection, positioning and maneuvering, surfing etiquette, and much, much more. Other beach activities we offer are: paddling, boogie-boarding, swimming, body-surfing, running, sand sculpture, and beach games such as Frisbee, Nerf touch-football, beach volleyball, dodge-ball and beach soccer. We also have break times to dry off, rehydrate and relax or play. No child is forced to participate in any activity, though we gently but strongly encourage our students to participate in all surf activities. Our mission is to get your kids surfing! To register for either our Santa Monica/Venice Beach or Manhattan Beach location, please fill out our Online Registration Form. You can also download and mail in our Printable Registration Form along with a Waiver. For more information, call (310) 663-2479 or E-mail Us.